What is the hottest topic these days? The 2018 FIFA World Cup Russia of course. Apart from surprising us with tight matches, astonishing goals, dazzling plays and elite players, the 2014 FIFA World Cup brought a great gift to football fans all around the world: One Love, One Rhythm–The 2014 FIFA World Cup Official Album. This album features songs by well-known Brazilian singers, of which there are the seething world cup song of Shakira named Dare (La La La) and another red-hot World Cup them song We Are One (Ole Ola). In the Shakira song La La La, this Colombian singer shakes her hips and throws a wild party, bringing you the passionate and hot Latin custom. As of this writing, this FIFA world cup song has received 322m-plus hits on YouTube so far. If you have ever watched it, you will know Dare La La La, Shakira Song, deserves download for a second watching and even permanent keeping. In response to WC fans' request for a Dara La La La download solution and a free Shakira songs download solution, here is the detail guide on how to free download Shakira song video Dare (La La La) to have an early preview of the enthusiastic World Cup. How to Free Download Shakira Song Dare La La La on Mac? For those who want to free download Shakira's Dare La La La, MacX YouTube Downloader (see also free video downloader Windows version) is high recommended for its strong ability to free download fifa world cup 2014 song Dare La La La. With this free YouTube downloader, you can not only download La La La for free, but also download other world cup songs like FIFA We Are One Ole Ola, Waka Waka, and experience a fast yet free Shakira songs download process in a few seconds. What makes the FIFA world cup 2014 song download tool highly acclaimed is that it supports different resolutions and formats, including common videos on YouTube, or HD videos 720p, 1080p or 4K ultra hd videos with the whole downloading process taking no more than 30 seconds. 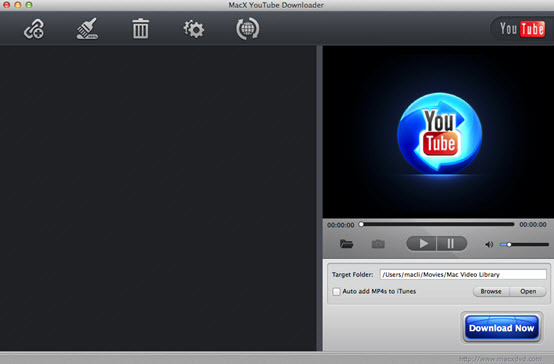 Prior to the Shakira song Dare La La La free download steps, please keep one thing in mind: MacX YouTube Downloader is especially designed for Mac users to freely download Shakira song La La La from YouTube. For people who are running on PC, please feel free to download the Windows edition. Free download and install the FIFA world cup song downloader on Mac or PC first. Launch the program for Shakira World Cup songs free download. Copy the URL of Dare La La La video page and paste the URL. Then click "analyze" to load the YouTube video details. Or click "paste & analyze" button to automatically detect the Dare La La La video opened in browse. Choose video format, resolution and file size you want. If you want to free download Shakira Dare (La La La) from YouTube, this free YouTube video downloader can automatically add the output MP4 videos to iTunes Library for transferring to iPad, iPhone, iPod or any other further use. Specify output folder on your computer to save the output files. Click the "Browse" button to choose the path where you want to save the song. Click "Download Now" to start world cup 2014 Shakira song download. 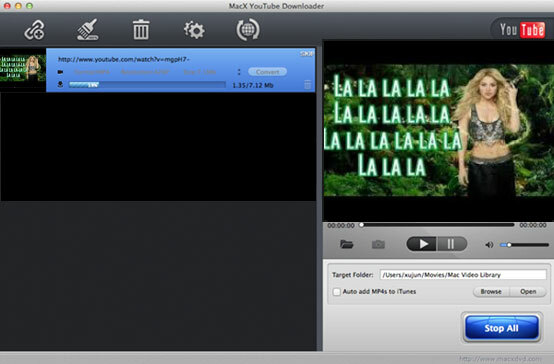 Tip: If you want to download Dare La La La and transfer the same for playing on your mobile devices such as iPhone, iPad, iPod, Samsung, HTC, PSP etc for enjoyment on the move, you can use MacX Video Converter Pro which is packed with YouTube downloader and video converter to let you finish La La La MP3 download by simply downloading and converting the Shakira hit songs to MP3 format with 98% quality reserved.